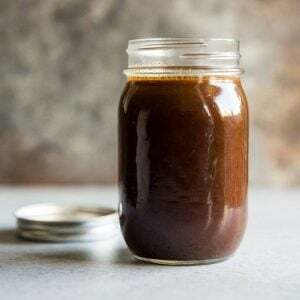 Appearing in everything from Deviled Eggs to Olive Tapenade and my favorite Homemade Caesar Salad dressing, Worcestershire Sauce adds rich, meaty flavors to everything it touches. Unfortunately, the store-bought variety often includes sugar or, even worse, high fructose corn syrup. Luckily, you can make it at home in minutes with pantry staples and a few Asian ingredients (all easy to find). I started by toasting a variety of warm, fragrant spices in a dry skillet for a couple of minutes. 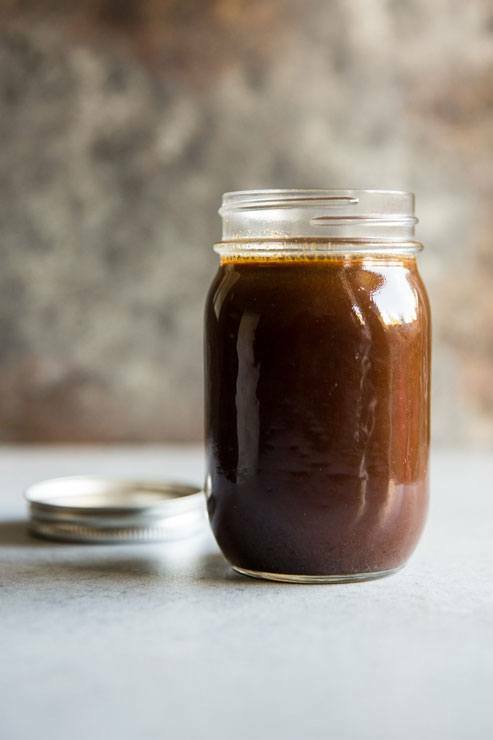 While those cool, make a simple vinegar mixture with molasses, water, and fish sauce. 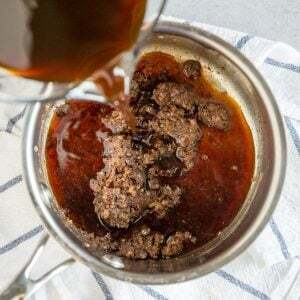 Blackstrap molasses has a strong flavor, but it works in this sauce. However, feel free to substitute regular molasses if that’s what you have. Also, if you prefer to work with actual anchovy filets instead of the paste, 5 anchovy filets, rinsed and minced may be substituted for the paste. I included both fish sauce and anchovy paste for the best, most complex savory flavor. (Be sure to use a fish sauce without sugar such as Red Boat brand.) Many recipes also include tamarind paste, but I had trouble tracking this down and thought the sauce tasted great without it. Still, if you have it in your pantry, feel free to include it in the vinegar mixture in Step 2. Sauté some shallots in olive oil until softened, then stir in the toasted spices, anchovy paste, and garlic. Whisk in the vinegar mixture, bring everything to a boil, and cool. Finally, finish the sauce by straining out all of the solids. This delicious, flavorful Worcestershire Sauce tastes even better than the national brands you can find at your local grocery store. And you made it yourself, and that’s always the best way! 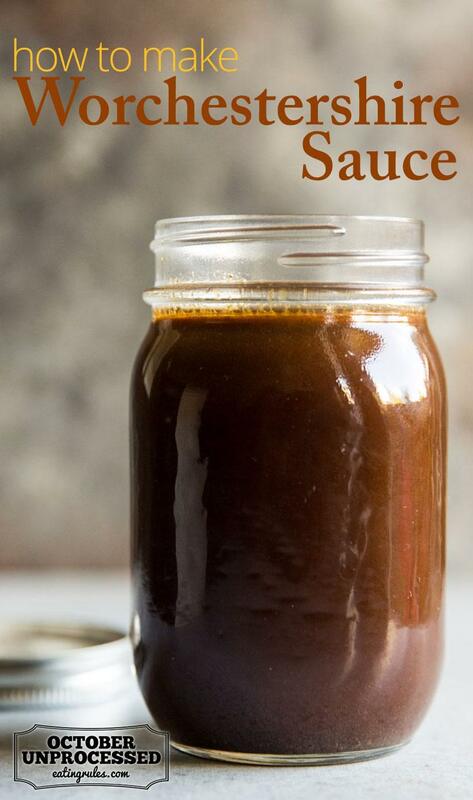 With only ten minutes of hands-on time, Homemade Worcestershire Sauce is an easy pantry staple to make yourself! Rich with fragrant spices and lots of savory notes, enjoy the sauce immediately or refrigerate for up to 6 months. 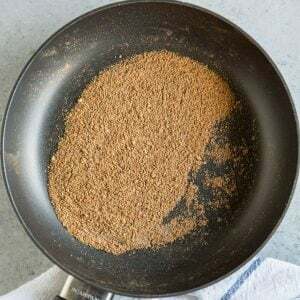 In a small dry skillet over medium heat, toast pepper, ginger, cinnamon, cloves, onion powder, and cayenne pepper until fragrant, 1 to 2 minutes. Transfer to small bowl. Meanwhile, in a medium bowl whisk vinegar, molasses, water, fish sauce and tamarind paste (if using) together. In a small saucepan over medium heat, heat oil until shimmering. Add shallots and cook until softened, about 5 minutes. Stir in spices, anchovy paste, and garlic until fragrant, about 30 seconds. Whisk in vinegar mixture, scraping up any fond on the bottom of the pan. Bring to boil, remove from heat, and cool 1 hour. 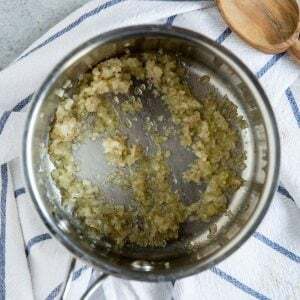 Strain through fine-mesh sieve or cheesecloth into medium bowl, pressing down on the solids to extract as much liquid as possible. Discard solids. Transfer to jar with tight-fitting lid. Enjoy immediately or refrigerate for up to 6 months. tamarind paste mostly found in Asian and Indian food stores. Not normally found in your regular grocery stores. Substitute for tamarind paste. If the recipe needed one table spoon of tamarind paste, simply substitute that with one tablespoon of vinegar. When using lime juice, on the other hand, you will have to use two tablespoons for every one tablespoon of tamarind paste. These two will also work well as tamarind sauce substitute and tamarind pulp substitute. 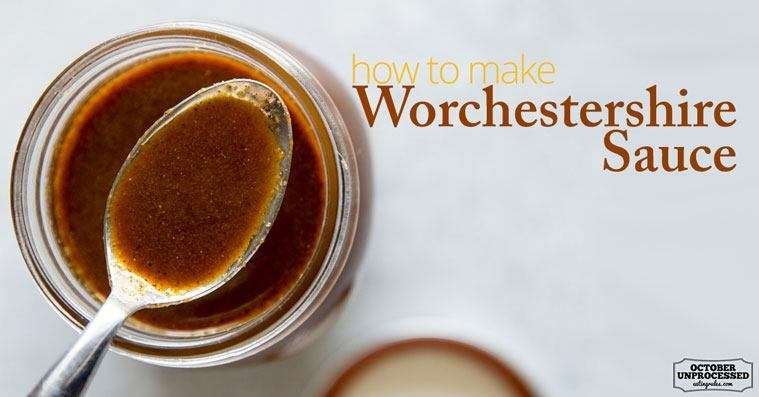 I never thought abut making Worcestershire sauce until I see how easy it is to make. Thank you! Ohh, thank you! Lea & Perrins is the only brand I know of, and it contains chili extract, to which my husband is allergic! Now I can make a toned-down version leaving out the garlic & peppers! PS Tamarind paste may also be available in the “Mexican” or “Latin” section of large supermarkets – or of course in a Hispanic grocery. I’m all for making things at home, and this recipe sounds great, but it still has a ton of sugar. Molasses is sugar. Worcesterhire sauce has anchovies in it. Without anchovies it is not Worcestershire sauce, they did sugest using a fish paste, which wouldnt be worcestershire, but other. May i ask why do you not want anchovies? They are high in omega 3’s by weight and give great flavor when portioned corectly to any dish.